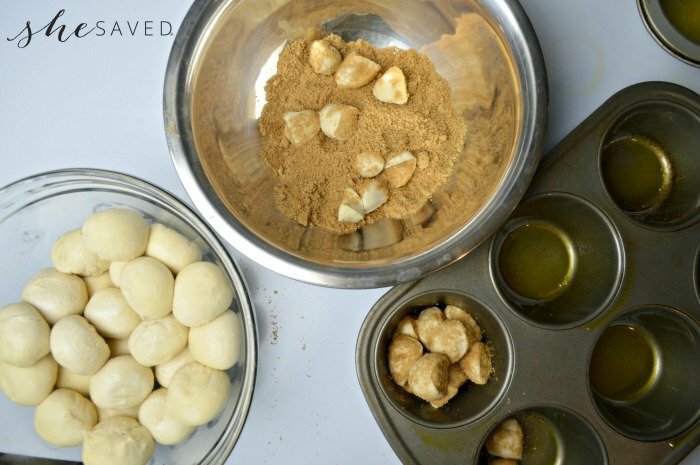 Monkey Bread is such a fun treat to make and to eat! 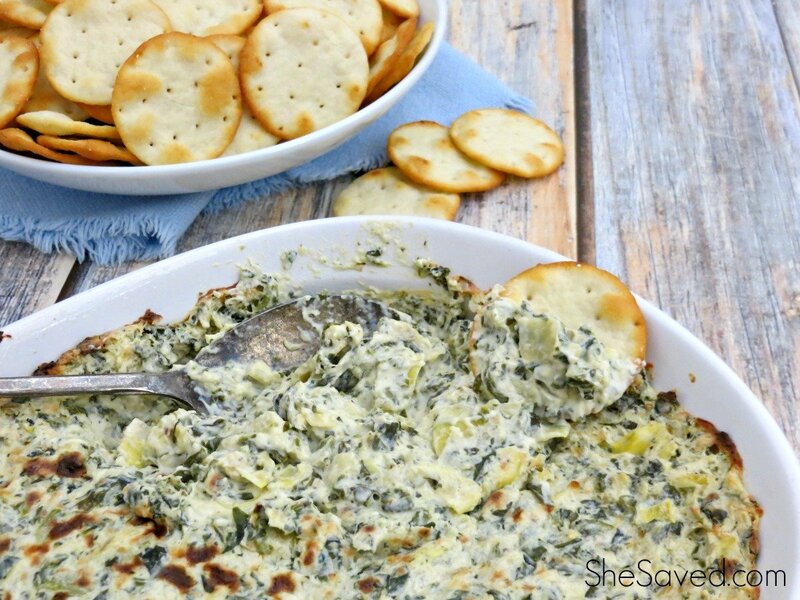 It can make a great warm breakfast straight from the oven or a perfect little snack. This individual-sized easy Monkey Bread Recipe is a great way to serve guests without having to make one single large cake and also makes a wonderful item for brunch parties, bake sales or large group gatherings! If I owned a coffee shop, this would definitely be on the menu, and if I visited a coffee shop and saw this on the menu, I’m pretty sure it’s what I’d be ordering! 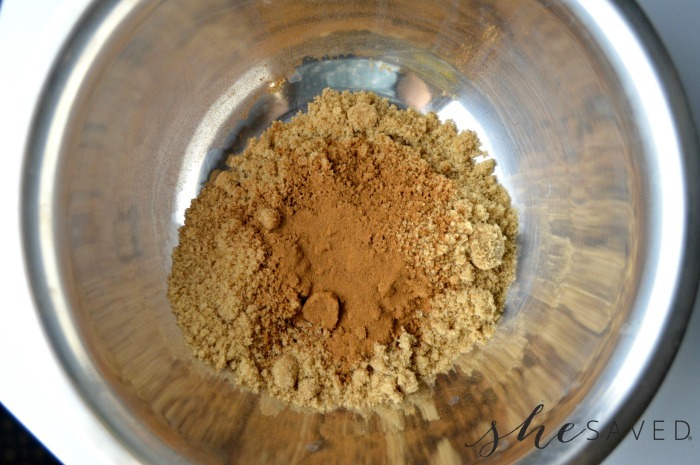 In a medium sized bowl, combine 1/2 cup brown sugar and the cinnamon. 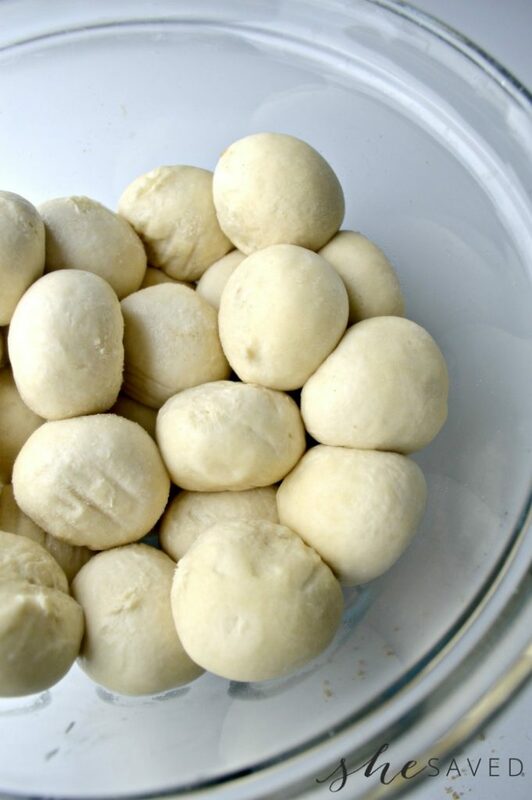 Bring your frozen roll dough to room temp or microwave for a minute or two until it’s no longer frozen. Cut the rolls into 4 pieces each. 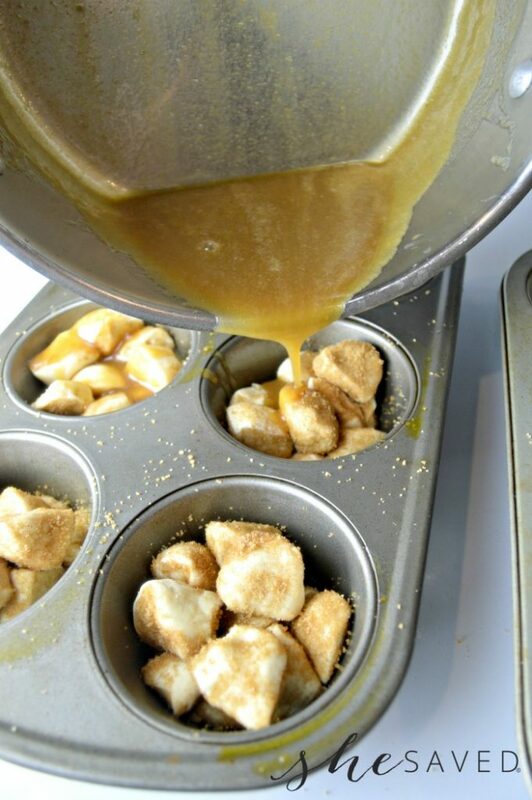 Toss each piece in the cinnamon and sugar mixture and then place in a jumbo muffin tin. Put 12 pieces of dough into each muffin cup. 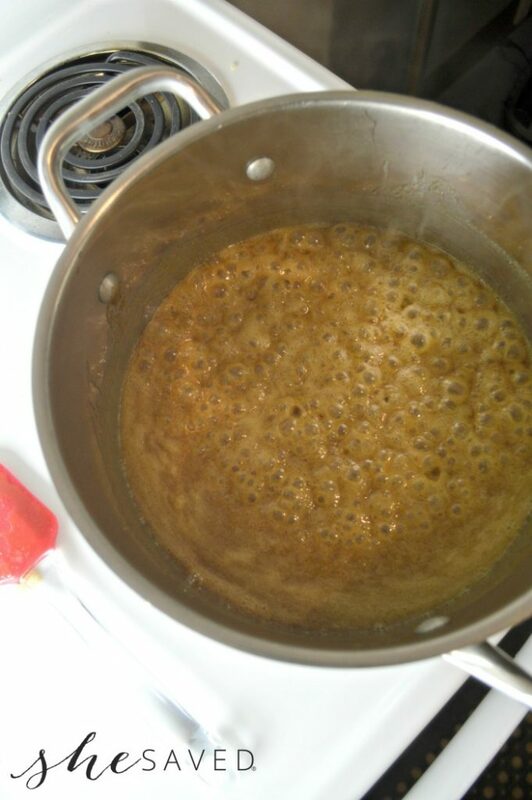 Make the caramel sauce by combining the remaining brown sugar, the half and half, and the stick of butter over a medium heat on the stovetop. Bring to a low boil and boil for about 2 minutes before removing from heat. 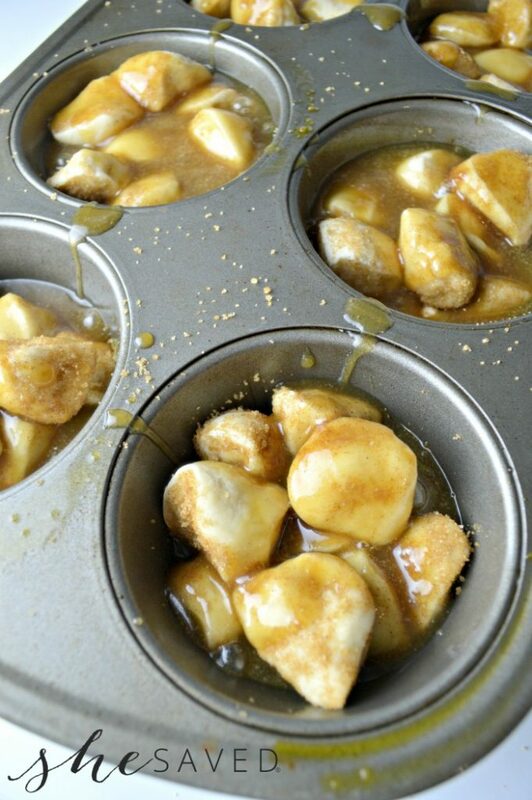 Pour the caramel sauce over each of the muffin tins, dividing evenly among all 10 serving sizes. Bake the Monkey Bread at 350 degrees for 15 to 20 minutes or until the tops are slightly brown. Pop out of the muffin tins using a spoon and flip over like you are serving an upside down cake. 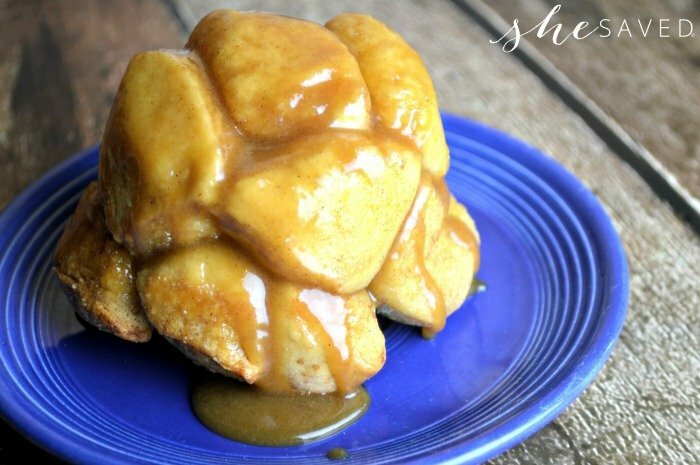 Pour any extra caramel from the inside of the tins over the monkey bread. 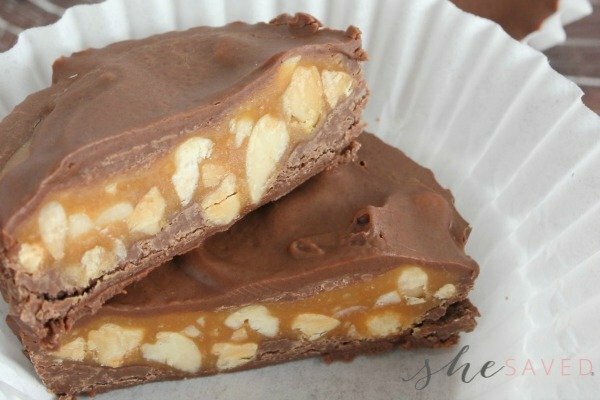 This recipe is one that my daughter loves to help me with and that’s a big part of the reason that I love the “easy” aspect. Sometimes it’s more about the time we spend together, and this recipe allows for quality time without a ton of prep. Plus, I have to say… the entire family loves it when we make breakfast sweets like this easy Monkey Bread, so it’s a huge win for all! 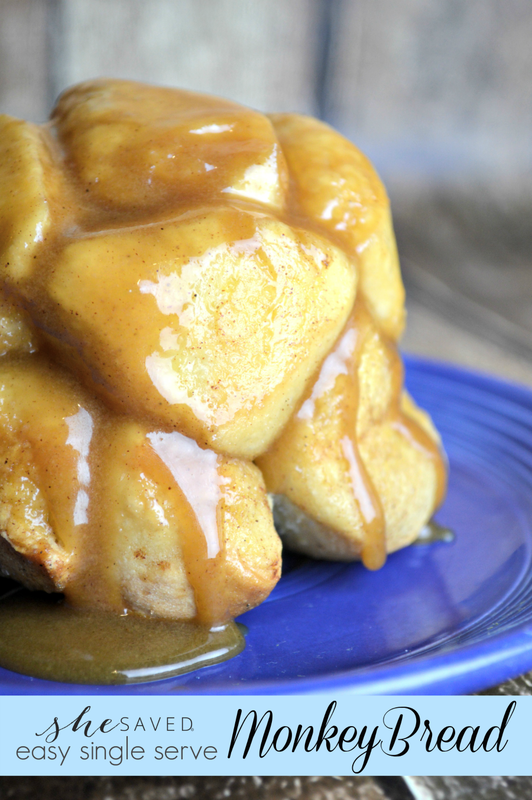 Will your family enjoy making this easy Monkey Bread recipe? What size are these rolls of dough? Who makes them? Hi Jerry! We use frozen Rhodes rolls - the come in balls in the freezer section, but any kind should work. I just tear them off into even smaller rolls. You will find them in the freezer isle at walmart, usually by the frozen garlic breads and such. This looks so good! I love that you made your own caramel sauce! I used the store brand rolls and OMG so so good! I never have half and half. Could I use whole milk instead?